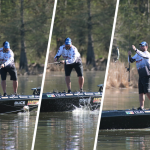 DAYTON, Tenn. (April 10, 2019) – In the five-decade history of organized bass-fishing competition, there have been very few 2 ½-hour displays of fish-catching proficiency the likes of which Major League Fishing® (MLF) pro Cliff Crochet put on this morning on Lake Chickamauga. Fishing in the Group B Shotgun Round of the Bass Pro Tour Econo Lodge Stage Four Presented by Winn Grips, Crochet caught his first scorable bass – a 5-plus-pounder – 12 minutes into the competition, and then went on a spree that saw the Louisiana pro stack 65 pounds, 11 ounces of Tennessee River largemouth onto SCORETRACKER by the end of Period 1. 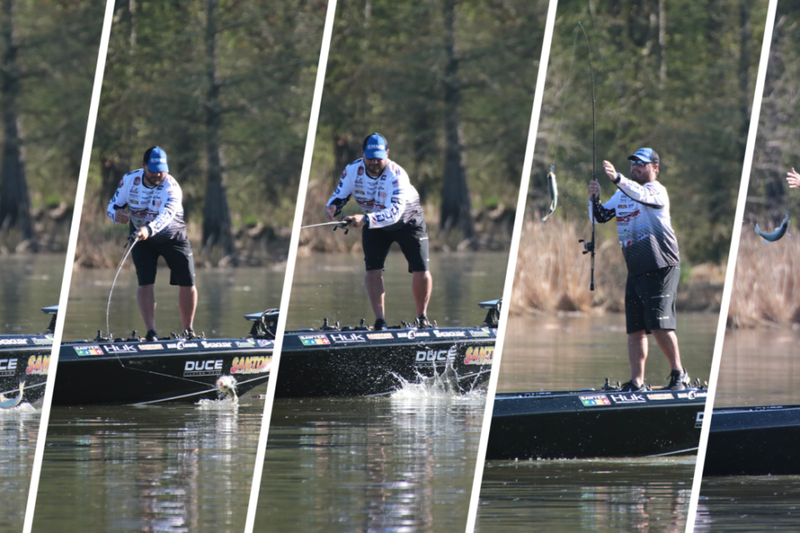 Crochet’s 31-fish, 65-plus-pound maelstrom of hookups in Period 1 was more than the daily total weights of 18 of the 19 round winners so far in the 2019 Bass Pro Tour schedule. “I didn’t know that was going to happen,” Crochet joked as he waited for the Berkley Postgame Show to start. “I caught four fish in the first little flurry, and I thought that was a good start to the day. Worst-case scenario, I could grind and have a decent day. I hit the second flurry and had enough sense to realize what was going on. 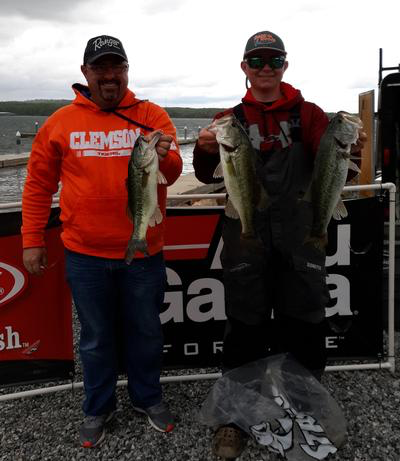 While Crochet’s cushion on the rest of the field was virtually insurmountable after the first period, a large percentage of the other 39 Group B anglers competing had strong days as well: Edwin Evers finished second with 55-2, Zack Birge was third with 51-4. 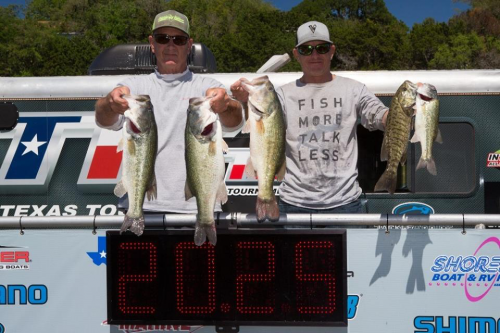 In all, 17 anglers put 37 pounds or more on SCORETRACKER during the day. 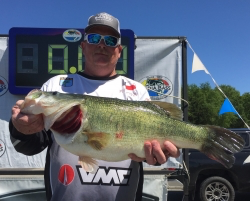 Dave Lefebre heads into that round with the comfort of the 59-14 he caught in his Shotgun Round, followed by five other anglers who landed 50 pounds or more. 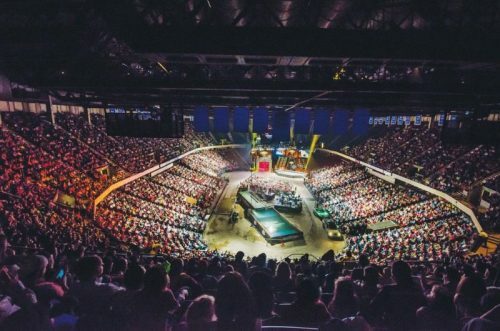 But unlike some previous Elimination Rounds – where the Top 10 could take their foot off the gas and “practice” during the day – the proliferation of fish catches (combined with the simmering potential for more 8-plus-pound giants to show up on beds) will likely keep most of the field focused on the task at hand. “These guys flat need to catch fish in the Elimination Round, there’s not much room to cruise,” said MLF NOW! analyst Marty Stone. Group B will fish the second Elimination Round on Friday. 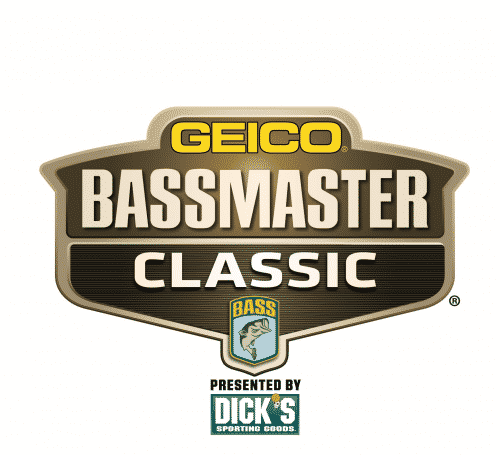 The Top 20 anglers from each of the two Elimination groups will advance to a 40-angler Knockout Round on Saturday – weights will be zeroed, making the Knockout a one-day scramble. The Top 10 anglers in the Knockout Round will advance to the Championship Round on Sunday, April 14.